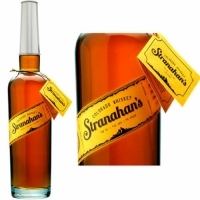 Stranahan's is an American single malt made from 100% malted barley, not a bourbon. The inferno copper-mahogany color of the liquid grips the sides of the glass. A whiskey that is perfect for sipping neat, a few splashes of water or rocks will douse the alcohol flames while opening up the nose and flavor compounds which hit you with intensity. First, a generous hit of vanilla and wood-yard oak, the sweet malty grains and tree-picked fruit backed up by intense spices and hints of charred wood smoke. Full-bodied and viscous, the warmth of alcohol and bold characteristics are present in the mouth. Oak, wood-spice and vanilla, orange peel, sweet honey, and malty grains. At the finish, the sweetness is replaced by a dryness with the wood-smoke coming to the fore.